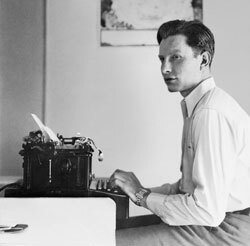 About L. Ron Hubbard – Author Services, Inc.
Born March 13, 1911, L. Ron Hubbard lived a life at least as expansive as the stories with which he enthralled a hundred million readers through a fifty-year career. Originally hailing from Tilden, Nebraska, he spent his formative years in a classically rugged Montana, replete with the cowpunchers, lawmen and desperadoes who would later people his Wild West adventures. And lest anyone imagine those adventures were drawn from vicarious experience, he was not only breaking broncs at a tender age, he was also among the few whites ever admitted into Blackfoot society as a bona fide blood brother. While if only to round out an otherwise rough and tumble youth, his mother was that rarity of her time—a thoroughly educated woman—who introduced her son to the classics of Occidental literature even before his seventh birthday. But as any dedicated L. Ron Hubbard reader will attest, his world extended far beyond Montana. In point of fact, and as the son of a United States naval officer, by the age of eighteen he had traveled over a quarter of a million miles. Included therein were three Pacific crossings to a then still mysterious Asia, where he ran with the likes of Her British Majesty’s agent-in-place for North China, and the last in the line of Royal Magicians from the court of Kublai Khan. For the record, L. Ron Hubbard was also among the first Westerners to gain admittance to forbidden Tibetan monasteries below Manchuria, and his photographs of China’s Great Wall long graced American geography texts. 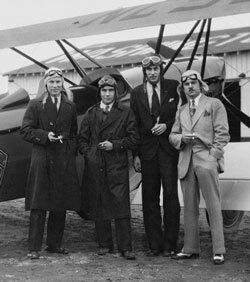 L. Ron Hubbard, left, at Congressional Airport, Washington, DC, 1931, with members of George Washington University flying club. Upon his return to the United States and a hasty completion of his interrupted high school education, the young Ron Hubbard entered George Washington University. There, as fans of his aerial adventures may have heard, he earned his wings as a pioneering barnstormer at the dawn of American aviation. He also earned a place in free-flight record books for the longest sustained flight above Chicago. Moreover, as a roving reporter for Sportsman Pilot (featuring his first professionally penned articles), he further helped inspire a generation of pilots who would take America to world airpower. Immediately beyond his sophomore year, Ron embarked on the first of his famed ethnological expeditions, initially to then untrammeled Caribbean shores (descriptions of which would later fill a whole series of West Indies mystery-thrillers). That the Puerto Rican interior would also figure into the future of Ron Hubbard stories was likewise no accident. For in addition to cultural studies of the island, a 1932–33 LRH expedition is rightly remembered as conducting the first complete mineralogical survey of a Puerto Rico under United States jurisdiction. Capt. 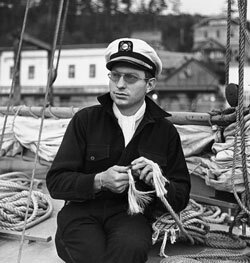 L. Ron Hubbard in Ketchikan, Alaska, 1940, on his Alaskan Radio Experimental Expedition, the first of three voyages conducted under the Explorers Club Flag. There was many another adventure along this vein: As a lifetime member of the famed Explorers Club, L. Ron Hubbard charted North Pacific waters with the first shipboard radio direction finder, and so pioneered a long-range navigation system universally employed until the late twentieth century. While not to put too fine an edge on it, he also held a rare Master Mariner’s license to pilot any vessel, of any tonnage in any ocean. To which one might add: His earliest submissions date from the summer of 1934, and included tales drawn from true-to-life Asian adventures, with characters roughly modeled on British/American intelligence operatives he had known in Shanghai. His early Westerns were similarly peppered with details drawn from personal experience. Although therein lay a first hard lesson from the often cruel world of the pulps. His first Westerns were soundly rejected as lacking the authenticity of a Max Brand yarn (a particularly frustrating comment given L. Ron Hubbard’s Westerns came straight from his Montana homeland, while Max Brand was a mediocre New York poet named Frederick Schiller Faust, who turned out implausible six-shooter tales from the terrace of an Italian villa). 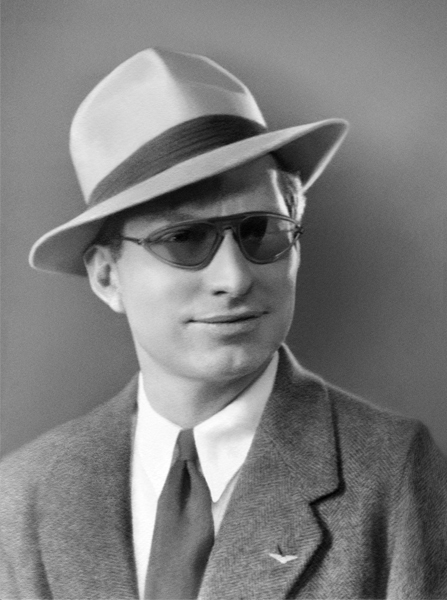 L. Ron Hubbard, circa 1930, at the outset of a literary career that would finally span half a century. Nevertheless, and needless to say, L. Ron Hubbard persevered and soon earned a reputation as among the most publishable names in pulp fiction, with a ninety percent placement rate of first-draft manuscripts. He was also among the most prolific, averaging between seventy and a hundred thousand words a month. Hence the rumors that L. Ron Hubbard had redesigned a typewriter for faster keyboard action and pounded out manuscripts on a continuous roll of butcher paper to save the precious seconds it took to insert a single sheet of paper into manual typewriters of the day. That all L. Ron Hubbard stories did not run beneath said byline is yet another aspect of pulp fiction lore. That is, as publishers periodically rejected manuscripts from top-drawer authors if only to avoid paying top dollar, L. Ron Hubbard and company just as frequently replied with submissions under various pseudonyms. In Ron’s case, the list included: Rene Lafayette, Captain Charles Gordon, Lt. Scott Morgan and the notorious Kurt von Rachen—supposedly on the lam for a murder rap, while hammering out two-fisted prose in Argentina. The point: While L. Ron Hubbard as Ken Martin spun stories of Southeast Asian intrigue, LRH as Barry Randolph authored tales of romance on the Western range—which, stretching between a dozen genres is how he came to stand among the two hundred elite authors providing close to a million tales through the glory days of American Pulp Fiction. In evidence of exactly that, by 1936 L. Ron Hubbard was literally leading pulp fiction’s elite as president of New York’s American Fiction Guild. Members included a veritable pulp hall of fame: Lester “Doc Savage” Dent, Walter “The Shadow” Gibson, and the legendary Dashiell Hammett—to cite but a few. The 1937 Secret of Treasure Island, a fifteen-episode serial adapted for the screen by L. Ron Hubbard from his novel, Murder at Pirate Castle. 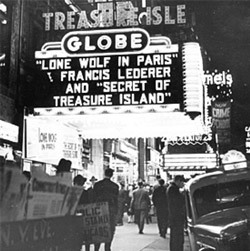 Columbia Pictures, remembered today as The Secret of Treasure Island. Comprising fifteen thirty-minute episodes, the L. Ron Hubbard screenplay led to the most profitable matinée serial in Hollywood history. In accord with Hollywood culture, he was thereafter continually called upon to rewrite/doctor scripts—most famously for long-time friend and fellow adventurer Clark Gable. In the interim—and herein lies another distinctive chapter of the L. Ron Hubbard story—he continually worked to open Pulp Kingdom gates to up-and-coming authors. Or, for that matter, anyone who wished to write. It was a fairly unconventional stance, as markets were already thin and competition razor sharp. But the fact remains, it was an L. Ron Hubbard hallmark that he vehemently lobbied on behalf of young authors—regularly supplying instructional articles to trade journals, guest-lecturing to short story classes at George Washington University and Harvard, and even founding his own creative writing competition. It was established in 1940, dubbed the Golden Pen, and guaranteed winners both New York representation and publication in Argosy. But it was John W. Campbell Jr.’s Astounding Science Fiction that finally proved the most memorable LRH vehicle. While every fan of L. Ron Hubbard’s galactic epics undoubtedly knows the story, it nonetheless bears repeating: By late 1938, the pulp publishing magnate of Street & Smith was determined to revamp Astounding Science Fiction for broader readership. In particular, senior editorial director F. Orlin Tremaine called for stories with a stronger human element. When acting editor John W. Campbell balked, preferring his spaceship-driven tales, Tremaine enlisted Hubbard. Hubbard, in turn, replied with the genre’s first truly character-driven works, wherein heroes are pitted not against bug-eyed monsters but the mystery and majesty of deep space itself—and thus was launched the Golden Age of Science Fiction. 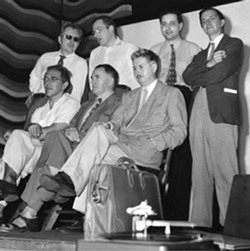 L. Ron Hubbard, 1948, among fellow science fiction luminaries at the World Science Fiction Convention in Toronto. And, indeed, at J.W. Campbell Jr.’s insistence, Ron was regularly drawing on themes from the Arabian Nights and so introducing readers to a world of genies, jinn, Aladdin and Sinbad—all of which, of course, continue to float through cultural mythology to this day. 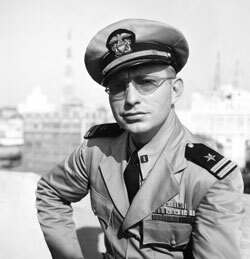 Portland, Oregon, 1943; L. Ron Hubbard, captain of the US Navy subchaser PC 815. Like many another who both lived and wrote American pulp adventure, the war proved a tragic end to Ron’s sojourn in the pulps. He served with distinction in four theaters and was highly decorated for commanding corvettes in the North Pacific. He was also grievously wounded in combat, lost many a close friend and colleague and thus resolved to say farewell to pulp fiction and devote himself to what it had supported these many years—namely, his serious research. That work was Battlefield Earth: A Saga of the Year 3000. It was an immediate New York Times bestseller and, in fact, the first international science fiction blockbuster in decades. It was not, however, L. Ron Hubbard’s magnum opus, as that distinction is generally reserved for his next and final work: The 1.2 million word Mission Earth. How he managed those 1.2 million words in just over twelve months is yet another piece of the L. Ron Hubbard legend. But the fact remains, he did indeed author a ten-volume dekalogy that lives in publishing history for the fact that each and every volume of the series was also a New York Times bestseller. He writes the way he does, brothers, because he’s been there, seen it and done it!